Soil nitrogen is spatially and temporally variable and it can be challenging for farmers to determine a location-specific optimum N rate, often leading to excess (insurance) applications. Corn N management is therefore relatively inefficient, with N recovery (the proportion of applied N taken up by the crop) often being less than 50%. The nitrogen that is lost through leaching and runoff has a massive negative effect on groundwater aquifers and aquatic biota in streams and estuaries downstream. The Chesapeake Bay and Gulf of Mexico are notable concerns and ambitious nutrient reduction goals have been established. Another major concern is the gaseous nitrogen loss that can result in high emissions of nitrous oxide (N2O), a potent greenhouse gas for which agriculture is the main anthropogenic source. These increased N fluxes into the environment have significant economic and environmental costs. There are a number of approaches to reduce such N losses, including reduced N applications, cover cropping, buffer strips, etc. Arguably the most important one is the better estimation of the optimum N rate so that excess N applications can be avoided. The optimum N rate depends on numerous factors including the timing and amounts of early season precipitation, previous organic and inorganic N applications, soil organic matter, carry-over N from previous cropping seasons, soil texture, rotations, etc. Adapt-N is a simulation tool that combines such location-specific soil, crop and management information with date-specific weather data to estimate optimum N application rates for corn. It thereby allows for precision N management specific to each production environment (field, season, management). The tool was developed at Cornell University and has been licensed for commercial use (adapt-N.com). The Adapt-N tool also has environmental utility as it simulates leaching losses from the bottom of the root zone and gaseous losses into the atmosphere due to denitrification and ammonia volatilization. Both leaching and gaseous losses are simulated based on soil water dynamics and the use of N loss equations that are modified by temperature and water conditions. (ii) a Grower-selected rate, which typically represented their conventional practice. We determined corn yields and associated profit differences for the two treatments. In order to directly compare the environmental fluxes resulting from Adapt-N and Grower sidedress N applications, we ran full season simulations (up to December 31st) for all 115 trials and estimated the environmental fluxes that occurred after the application of sidedress N.
Complete results for this study are presented in Sela et al. (in review). We measured clear agronomic benefits from the precision approach of the Adapt-N tool over the Grower treatment: N rates were on average reduced by 40 lbs/ac (34%), while average yields were actually 2 bu/ac higher. This resulted in $26/ac higher profits on average over all 115 strip trials. For all trials in both states, simulated total N losses (leaching and gaseous combined) were on average reduced by 24.9 lbs/ac (38%) for the Adapt-N recommended rates compared to the Grower-selected rates (Fig 2), in line with the lower applied N rates. Simulated total N losses for the Iowa trials were on average somewhat lower than for the New York trials, presumably due to different climate and soil conditions. Leaching losses: The average simulated leaching losses of 35.3 and 22.6 lbs/ac (Figs. 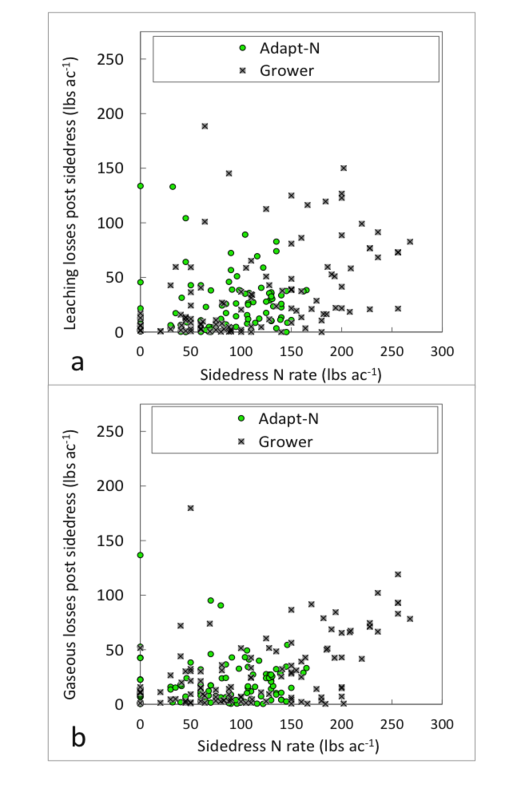 2a and 3a) for the Grower and Adapt-N treatments, respectively, are comparable to measured leaching losses from other experiments in the literature. 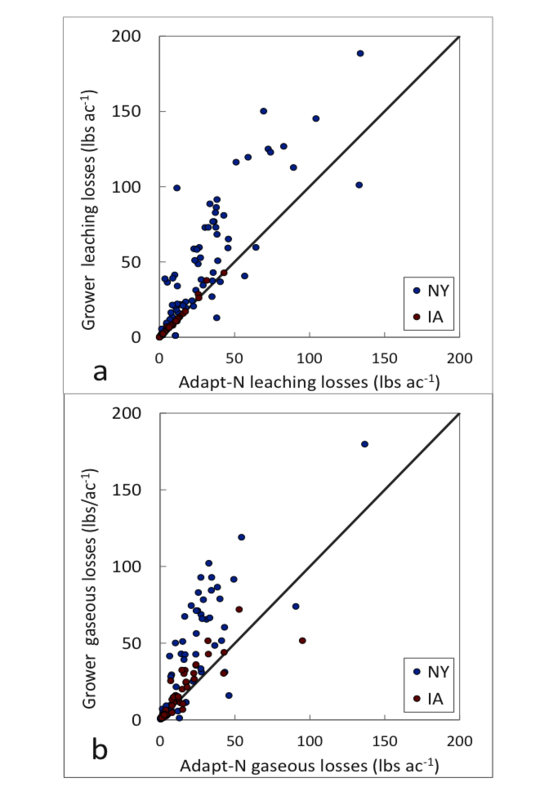 Adapt-N rates resulted in an average reduction of 19.6 lbs/ac (39%) in New York and .3 lbs/ac (3%) in Iowa in simulated leaching losses compared to the Grower rates, and reductions were consistently higher for the New York trials. This can be attributed to several characteristics of the New York sites, including (i) generally wetter climate with much pre- and post-season precipitation, (ii) lower denitrification losses relative to leaching due to generally coarser soil textures, and (iii) shallower rooting depths causing less water and N uptake in the lower soil profile. Simulations were terminated on December 31 of each year, so are underestimates of actual benefits in both states, as further N leaching may still have occurred during spring and winter prior to the next growing season. Gaseous losses: Simulated gaseous losses (Figs. 2b and 3b) were also lower for the Adapt-N compared to the Grower treatment (average reduction of 12.9 lbs/ac; 39%). The 2011 and 2012 seasons for the New York trials resulted in >50% reductions in simulated gaseous losses when using Adapt-N vs. Grower rates. Again, benefits were generally greater in New York than Iowa, although the relative reduction in gaseous losses in Iowa were greater (18%) than the reduction in leaching losses (3%). The results of this study show environmental gains from using Adapt-N’s precision management approach to estimating in-season N rates across a robust number of fields, soil types and weather conditions in Iowa and New York. In all, the Adapt-N recommended N rates adapted effectively to the varying field and weather conditions, were generally lower than the Grower’s regular N rate, and achieved both economic and environmental benefits. Although the benefits varied by year, state and site, the overall environmental losses were reduced by 24.9 lbs/ac (more in NY than IA) through the use of this precision management approach. This implies a reduction of 38% in the post-application N losses. In all, use of Adapt-N can significantly contribute to nitrogen reduction goals. A final note: The potential benefits of its use are likely underestimated in this study, especially for IA, as the participants already represented a progressive group of growers who optimize their own N timing and placement decisions with sidedress applications, while many Midwestern growers still apply most of their nitrogen in the fall or at planting. This work was supported by funding from the USDA-NRCS Conservation Innovation Program grant number 69-3A75-10-157, New York Farm Viability Institute, USDA-NIFA WQ grant number 2013-51130-21490, the Northern New York Agricultural Development Program, USDA-Sustainable Agriculture Research and Extension grant number LNE13-328, the International Plant Nutrition Institute, and the McKnight Foundation. We are grateful for the cooperation in field activities from Keith Severson, Sandra Menasha, Anita Deming, and Michael Davis of Cornell Cooperative Extension, David DeGolyer, Dave Shearing and Jason Post of Western NY Crop Management Association, Eric Bever and Mike Contessa at Champlain Valley Agronomics, Eric Young at the Miner Institute, Peg Cook of Cook’s Consulting, and Hal Tucker, Michael McNeil, and Frank Moore of MGT Envirotec. We also are thankful for the cooperation of the many farmers who implemented these trials on their farms.